It has always been my assertion that the dedicated and skilled craftsmen who make Scotch create a delicate balance of flavours and aromas that are ready to drink. Therefore it is my view that the addition of mixers such as cola, ginger ale or other such liquids is sacrilege and dishonours the maker. I also believe that dilution of the Scotch with water (still or sparkling) alters the flavour structure and complexity thereby reducing the full experience available to the drinker. However, there are times, particularly on a hot summers night, where a chilling of dram is desired…. but ice??? Sigh. It has been done and provided the liquid is consumed quickly one gets the chilling effect before the ice melts and dilutes the scotch. I have also considered keeping the bottle chilled but that dulls the flavours much as an over chilled chardonnay loses its robustness. These cubes of soapstone are environmentally friendly, always ready, water saving, aesthetically pleasing, re-useable beverage chillers that come with a convenient velvet pouch for storing them in the freezer. Oh and they don’t dilute your scotch and can be used in other beverages like wine, juice, whatever….. Cheers Alisha – thanks for the pressie. 23. 1986 A hard year with a health scare. Dad rarely uses ice blocks but perhaps I should get him some of these special cubes for the hot summer ahead! 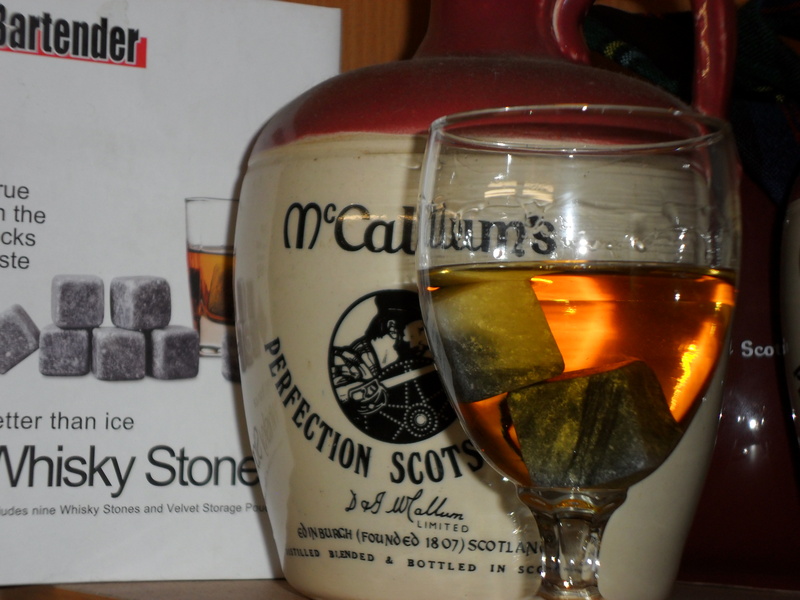 Thank you for taking the time to write a positive review on our Bartender Whisky Stones. I hope you continue to enjoy using our product for many years to come. STRAIGHT !!!! or plain soda water if it os a Roughy !!! Yeah Dad – nice to chill it a bit on a hot summers night…without diluting it at all!!! Sign up so you dont miss any new recipes and stories.